This book actually had some video embedded but that did not come out. I guess the conversion program has its limits. Anne arrived at a conference after many hours of traveling. I hope she blogs about the event. After school on Wednesday, I drove 3.5 hours to Melbourne to catch the MH138 flight to Kuala Lumpur from terminal 1, gate 10 for a 7.5 hour flight, on a plane that was only 2/3 full, which landed me in KL at 545 hours for a 10 day break with 6 days long service leave and 3 days of MS Innovative Teachers conference. And Nina, too, is conferencing this week. You just have to love the name of Webheads in Action. In the 72-hour online marathon of the Webheads in Action Online Convergence I have so far logged 24 hours about evenly divided between Learning Times/Elluminate and Second Life; we are about halfway through. Jo’s equation here is a struggle for her as she juggles kids and computers when the numbers don’t quite add up. My smallest sophomore class has 21 students + I have 3 student computers in my room + the 1 available computer lab is closed for testing + the library houses only 13 computers and was only open to me for 2 days (due to testing) = 1 huge headache from finagling resources to get research projects done. Ken goes the route of using numbers for words in his creative way. Which, of course, is what I always expect from Ken. This has been 1 busy week that, 2 put it bluntly, has 3 aspects to it that will bring 4th at least 5 separate issues, the 6th derivative of which precedes the 7th as you might expect by the same margin that exists between 8 and 9, and if you feel there should be a 10th part to all of this, then you subscribe to a pre-20th century concept, that of decimalisation. Ykes! Janice is hit by the Number Plague this week. 33 is the number of sleepless hours I’ve spent this week worrying about all the math concepts my grade 6 students still don’t know, and 3 is both the number of school days and the number of math periods left before the dreaded EQAO test that will remind them of all that they do not know, $450.00 is the amount of money I’ve spent so far trying to get rid of a ridiculously annoying plantar wart on my heel, 10 is the number of weeks I’ve been visiting the foot doctor hoping for said persistent wart to DIE, 49 000 000 is the number of dollars I did NOT win in this weeks lottery, and 5 is the duration (in seconds) of my long heavy sigh as I think about all these things! Illya sees two plus two equaling four, even if the first two may not quite equal the second two (confused? read on). Out of four days of vacation, I happen to be in bed for two of them, leaving two more to have fun on, hopefully. Paul also gets creative with the number-word conversion system. 1 day left 2 the 3 day weekend be 4 the last 5 weeks of school. The countdown for Art is underway. The last 5 days of school I find myself more restless and ready to leave than many of my students. The ol’ Email Timekiller hit Connie. I know that one all too well. After three cups of black tea, pondering which of my 34 overnight emails to respond to before 8:30, I notice a pattern: one email led to 2 others, which led to 3, then 5, 8, 13, 21; suddenly I feel dizzy like I’m spiraling into the day as a Whirling Dervish. Gail P. has little ones moving up. I love seeing her and her students in our building. They are darn cute. 17 kindergartners from my class will move on to 4 different grade 1 classrooms in 25 more school days, or is that 24 now, but who’s counting, right? Bonnie was all about digital story celebrations earlier this week as her ongoing work with a local school paid dividends when the kids shared their work with their families. 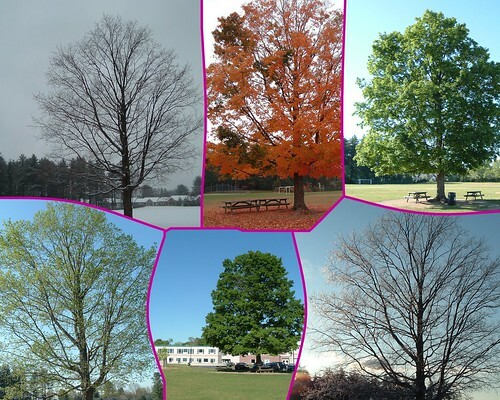 I created a digital story focused on celebrating the digital stories of 76 very cool 6th graders but when the numbers were counted officially , it was really 79 digital stories of 79 6th graders with the support of 2 classroom teachers, a tech teacher, a substitute teacher and one HVWP TL. Thanks to all of you for sharing! I had my students take an online reflection last week as the final stage in the Digital Science Picture Books (on cell mitosis) after we shared the books with other students. We may yet do more sharing next week. Here are some of the results of the survey. These questions tried to get at the use of technology in creating a book project. Click on the image to get a larger viewing. My own interpretation is that my students are becoming much more adept at using the technology to create the books and much more comfortable. I had more use of audio and more use of embedded video, and more ease of these tools than in past years. It may be that I am getting better at structuring the lessons, or that they are more comfortable with the tools, or that they are unafraid to try new things. They seem pretty fearless, for the most part, when it comes to using the computer as a tool for composing a book. I like that and wish more teachers were like that, too. What my tagline means …. Long ago, when I first started this blog, I added a tagline quote from Charlie Parker. I thought carefully about that tagline and wanted it to capture the concept that this would be a place where I would explore the intersections of writing and technology myself so that I could consider the implications for my students in the classroom. Yesterday, I was asked by my friend Christina to explain what that tagline means. It is going to be used for a book by the National Writing Project on the topic of digital writing in the classroom (exciting!) and it only took me a few minutes to write out my response. The response came quick because I think about this idea all time when I am tinkering and connecting and doing my odds and ends on this blog. This quote means a lot to me because it captures the concept that you have live the world in order to understand it. As teachers, we don’t often spend enough time exploring technology and writing ourselves before bringing it into the classroom. But I would argue that this kind of exploration is the key to understanding the possibilities of learning and critical thinking of our students. I am also a saxophone player and as a kid, Charlie Parker was a musician that I idolized (not for his drug use, which I learned about later). His focus on his own vision of music and his creativity and imagination, and the way he brought the world into his music and his music into the world, touched something in me in a way that has remained with me until this day. My friends had pictures of athletes and rock and rollers on their walls; I had Bird. I was thinking it might be cool to try to add a numerical element to our Days in a Sentence. See if you can work some sort of number into your reflection this week. It could be a countdown to something. It could be a tally. It could be some creative operation that shows something else. It could be just about anything. I will gather up and publish them over the weekend. After many floating deadlines have come and gone, 74 students who spent 17 classroom periods (about 15 hours of project planning, writing and construction) working on 39 digital science books are almost completely done. I love the creativity of the late Jim Henson. His work transformed entertainment for young people (and their parents) in ways that still affect us today. He knew you didn’t need to talk to down to kids. You needed to reach them in meaningful ways using powerful characters, sense of humor and lessons that did not hit you over the head (unless you were being chased by the Swedish Chef). Puppets provided the outlet for Henson and his crew, and that energy is something I try to bring to my classroom of young writers and performers when we do our own puppet unit each year (see the Puppet Website from this year). 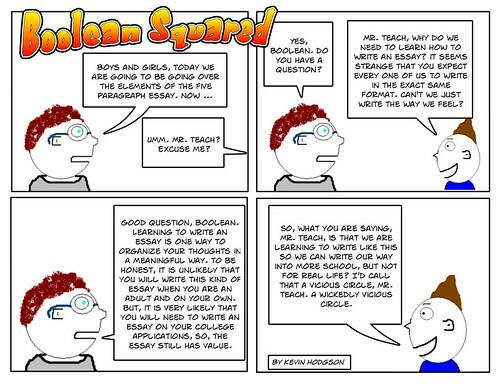 This week begins a series in my Boolean Squared webcomic about the Five Paragraph Essay and its relevance for young writers. In a world of communication and connectiveness and authentic writing for real global audiences, isn’t it worth a wonder about why we still teach this style of rote form writing? (Of course, I know why – organization, development of thought, etc). You can read the comics as they are published at the local newspaper or grab the RSS feed or go to my homesite of Boolean Squared for all the comics from this year. I have about one more month of comics and then I will end Boolean for the school year. I am not sure about the future, but that is fodder for another post soon. I don’t mean for this to be an advertisement for Google, but I has been hearing about the Google Wonder Wheel for a few days now and decided I wanted to see what it is. Although still in the beta stage (I think), the Wonder Wheel is part of the search engine, showing semantic connections in a search query. In other words, you can see concepts branching off from the main query. For example, I used Google to search for “Graphic Classroom” and the wheel expanded in any number of directions — showing me sites with lesson plans, books for reluctant readers and more. 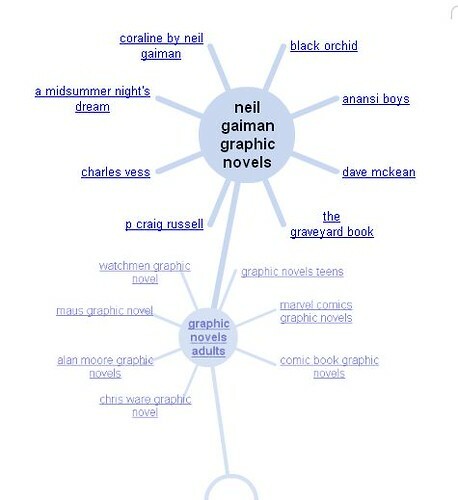 As I began to journey on the wheel, I found “adult graphic novels” and followed the thread to Neil Gaiman. Pretty nifty use of visual search technology.